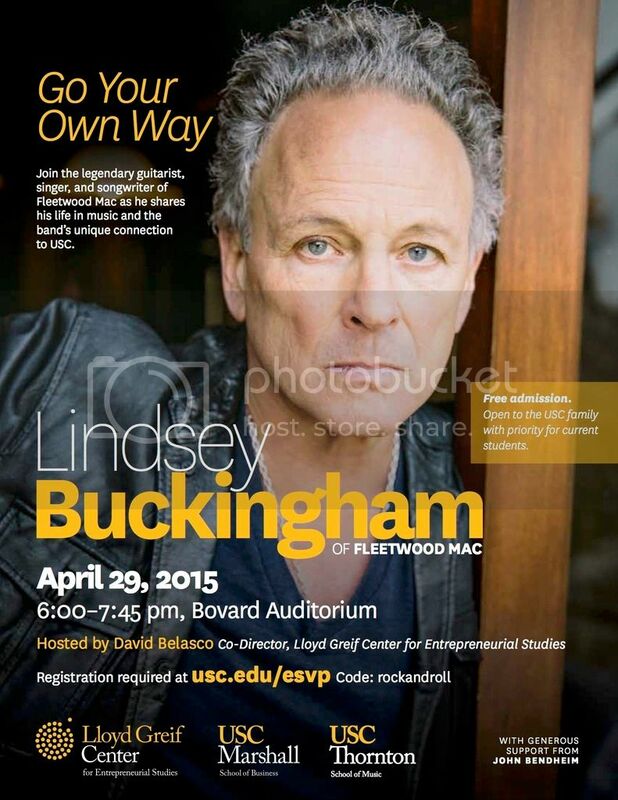 Our old friend Lindsey Buckingham will be on campus on April 29 to share his life and music and talk about Fleetwood Mac's unique connection to USC. In 1979, the USC Trojan Marching Band accompanied Fleetwood Mac on its song "Tusk" making them the only collegiate marching band to receive a platinum record. Lindsey Buckingham wrote that song and countless others earning Fleetwood Mac the distinction of one of the best-selling bands of all time with more than 100 million records worldwide. This Wednesday night at 6:00p.m., Buckingham will be performing at USC in the Bovard Auditorium for a night to celebrate the end of the school year put on by the USC Marshall School of Business, Lloyd Greif Center for Entrepreneurial Studies and the Thornton School of Music. Wish I wasn't working, I'd be there. didn't anyone go to this? It hasn't happened yet, Jamie. It's tonight. Oh gosh. Duh! Sorry - got my days mixed up somehow. over 1.5 hrs of incredible!! two of my friends were there, and they report it was pretty incredible. i hope one of them may be able to report here. LB was in great mood for Q&A, joking around and bsing apparently, besides his usual stock statements. his wife and two of his kids were there, too. he received a music entrepreneurial award. he performed NGBA, Bleed To Love Her, Big Love, Tusk and Go Your Own Way, the last two with USC Trojans. there are vids of BTLH, Tusk and GYOW being uploaded to youtube. all songs were really cool and unique cause he couldn't use his regular guitars. all in all, very happy and envious for all who got to be there - seems like it was something completely out of the ordinary!! Thanks Elle, ohhhh to have been there!! He performed too?? Crap - had I known that I'd probably have gone. This message has been deleted by HelloMonster. Looks like the band director is still Art Bartner, the guy who did the (USC)band arrangements for the album recording. He and Lindsey seem to have developed a simpatico relationship over the years. It's very cool how the song has transcended it's pop/rock and roll incarnation to become woven into the fabric of institutional life at USC, a sort of "fight song" for them, giving the song a legacy that goes beyond LB, the band, and rock and roll. I'm dying to hear what he talked about. Last edited by bombaysaffires : 04-30-2015 at 02:35 PM. Lindsey Buckingham, the guitarist of the renowned ’70s band Fleetwood Mac, took a break from the band’s tour to speak to a packed crowd in Bovard Auditorium on Wednesday night. Fleetwood Mac is best known for its Grammy Award-winning album Rumours which was released in 1977. At USC, however, Fleetwood Mac is best known for having recorded the song “Tusk” alongside the Trojan Marching Band. The talk was hosted by the Lloyd Greif Center for Entrepreneurial Studies as part of David Belasco’s class, BAEP 470: The Entrepreneurial Mindset – Taking the Leap. Upon introducing Buckingham, Belasco remarked that that night was special because it was all about the USC family and the experiences they share. Taylor DuPont, a sophomore majoring in business administration, said that she attended the event because Fleetwood Mac was an important part of her childhood. “Fleetwood Mac is my favorite band. I grew up listening to them and continue to do so. When I found out that Lindsey would be on campus, I jumped at the opportunity of seeing him talk and play,” she said. During the talk, Buckingham discussed his youth, how he met his bandmate and former lover, Stevie Nicks, and how he came to join Fleetwood Mac. He then discussed the success of Rumours and how it was also a difficult time for the band members because their romantic relationships were disintegrating. Buckingham said this difficult time affected his career. Belasco asked him whether great art required great pain. “At the very least, emotional experiences will only broaden your creative landscape,” Buckingham said. For every song that he performed, he received a standing ovation from the audience. “We wanted something that would sound like a jungle roll and hypnotic. How Bartner got in the picture, I don’t know. Maybe Mick?” he said, referring to the band’s drummer. A video from USC’s archives that showed the day that “Tusk” was recorded at Dodger Stadium was shown. Belasco explained that through “Tusk,” the Trojan Marching Band was able to set two unique records, one for the first collegiate marching band with a Grammy-winning record and one for the most musicians collaborating on one single. Following the talk, students asked Buckingham questions. He provided them with advice regarding the definition of success. “I was never really [goal-driven]. I was focused, but not necessarily trying to do anything for anything other than my own success,” Buckingham said. The talk ended with Buckingham performing “Tusk” and “Go Your Own Way” with the band. Earlier in the talk, Buckingham said the work of Fleetwood Mac has been able to reach such a wide array of generations. “We have gotten teenagers whom our body of work seems to make sense to,” Buckingham said. Students said after the event that they were very pleased with Buckingham’s talk and performance. Jake Simon, a junior majoring in business administration, said that he felt very fortunate to have been able to attend. “I was in the second row and it was beyond incredible,” he said. Cristina Gomez said she was impressed by the uniqueness of the event. “This was like a personal concert for ourselves along with stories. It was so impressive!” she said. At the event, the Lloyd Greif Center awarded Buckingham with a trophy that recognized his contributions to the university, as well as his musical entrepreneurship. Fleetwood Mac’s Lindsey Buckingham wore a USC band helmet at the end of his talk at Bovard Auditorium. Buckingham performed Tusk with the USC band at the end of the show. Even Pat Haden and J.K. McKay were on hand at the beginning.